When the heart of your business lies in business-to-business sales, it’s important to make long-term relationships with your customers. After all, you want to set yourself up early on as the go-to choice for meeting their needs and solving their biggest headaches. Today, there are many ways to foster your working relationships. One being to utilize the best content options available. And, luckily, many of these options are inexpensive and allow you to reach a wide audience. Also, by providing relevant and educational information, you’ll continue to build your visibility. Ultimately, the more visible you are, the more you’ll start to cement your relationship with your ideal customer. Curious as to how to get started doing just that, however? 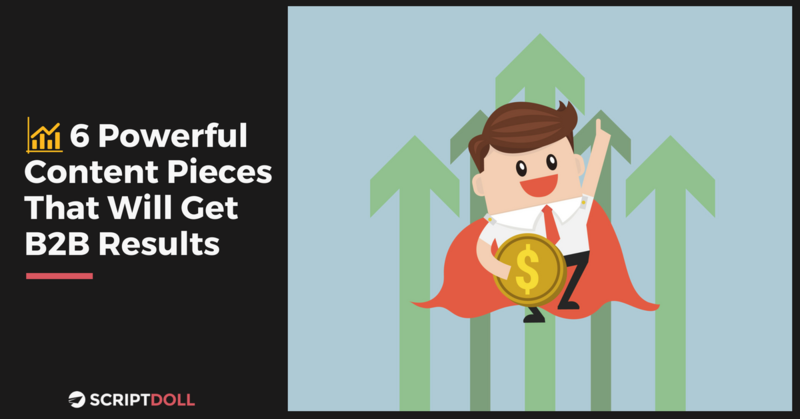 Well, we’ve made it easy for you by putting together our list of the top six powerful content pieces that will get you B2B results. Not to mention, the reasons we like them and ways you can use them to propel buyers towards that all-important CTA button. Are you implementing all six of these marketing methods yet? As you prepare your content for your B2B marketing efforts, you’ll need to identify and understand your customer’s biggest needs. The more you understand them, the more you can ensure you’re going in the right direction. That’s why we’re offering you our Ideal Customer Worksheet for FREE. All you need to do to get your hands on it is enter your email address in the pop-up box on the right-hand side of the page. As you fill it out, you’ll be able to focus your messaging on the kind of content that gets that infamous CTA button of yours clicked time and time again. We want to know: what’s been your favorite method of marketing to your B2B customers? Share your thoughts in the comments section below.